How Do Multi-PI Applications Fare? A question that I hear often from investigators is: are my chances of funding increased or decreased by submitting a multi-PI application? It was seven years ago that NIH implemented the Multiple Principal Investigator Policy to encourage interdisciplinary and team approaches to biomedical research, and give scientists the option to apply with their peers and allow for equal credit for leadership of the research program. While the single-PI model works well, and continues to be the model for most of NIH’s research grants, the multi-PI option recognizes that as health research grows in scale and complexity, scientific teams may better reflect the intellectual and scientific leadership within a given grant application. Only in 2013 is there a significant difference in award rate between single PI and multi-PI award rates, and this is in favor of multi-PI awards. But for most years, and overall, there doesn’t seem to be a trend indicating that multi-PI applications are more (or less) likely to be awarded than single PI applications. So, when you’re applying to NIH for research funding, while there are many other considerations to take into account in deciding whether to submit a multiple-PI application, preference for funding is not one of them. As always, the key questions to ask is: what would best address the science being proposed? Would a single- or multiple-PI model best ensure optimal leadership of this research project? Additionally, when considering the multi-PI option, be sure to consider how you will structure the roles of the investigators to meet the goals of your proposed research. If you’re looking for more information on the multi-PI policy and how it works, visit our website and frequently asked questions on the multi-PI policy. This entry was posted in blog, Rock Talk and tagged Award rate, Funding data, multi-PI, multiple PI by Sally Rockey. Bookmark the permalink. While the funding rates are similar, do you have any numbers on the average typical R01 percentile of funded multi-pi versus single-pi grants. Also, do you have any numbers on the triage rate of multi-PI applications versus single-PI. Lastly, it would be nice to know the average percentile of discussed grants (first pass, and second pass) for multi-PI versus single-PI. Thank you for this information. I wonder if multi-PI applications have a higher chance to receive a non-modular (higher) budget than single-PI? It is very likely that the expenses on a project involving two labs would be higher than for a regular one. I would like to know if early career applicants have a higher success rate when including a senior investigator as a co-PI. It would be useful to look at modular vs. non-modular applications and MPI within a single institution vs MPI at multiple institutions vs Single PI applications. 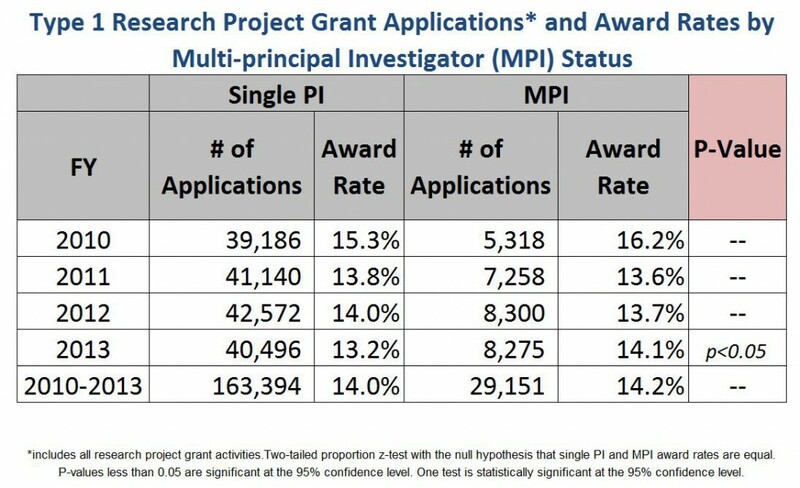 When we looked at our own R01s separating out these items it was clear that Modular R01s with MPIs all within our Institution fared poorly compared to single PI grants, but non-modular MPI grants with more than one MPI institution applications did well. This might be specific to our own experience or it might be true for other applicants.